I’m so excited to bring you the first interview in my 'Fab Over 40' series. Every month I will be chatting to a fabulously inspiring woman over 40 to discover more about them and how they live a life they love. 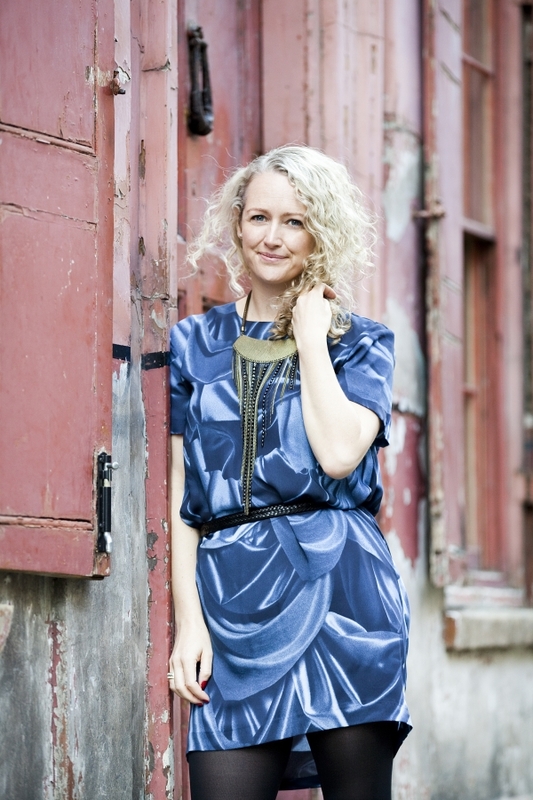 This month’s very special guest is Esther Zimmer a Coach and Soulful Personal Stylist. I first connected with Esther over a year ago when we did an online course together and since then I have loved following her work and beautiful wisdom via Facebook, her website, and 1010ParkPlace where she is a guest writer. I hope you enjoy my interview with her and do check out her very generous special offer for all of you at the end. Being married to my best friend who makes me laugh every day and being part of two big, close families. Even though we don’t see them very often, I adore both my own family and my in-laws. I also love having the freedom to be creative and do meaningful work. You are an Australian living in London, married to an American - as a Brit married to a Kiwi, who I met in Hong Kong, I absolutely love your story. Can you tell us how you ended up in London and how you met your lovely husband? Wow, I love your story too! There’s a photograph of me as a toddler holding a beach ball with a map of the globe on it. I was fascinated by that map and for as long as I can recall I wanted to travel the world. My mum is Scottish so, just before I turned 27 I applied for my British passport, packed my bag and moved to London. Within two weeks I had a job with a global advertising agency and my travel dreams came true. I’ve barely stopped travelling since. I was just weeks away from a six-week trip of Latin America when I met my husband. I thought it would be fun to try online dating whilst I waited for my departure date – the last thing I expected was to actually meet someone! We’ve been together for 12 years now. You work as a coach and a soulful personal stylist. tell us more about what you do and why you do it. I left a 20-year corporate career in 2013 to launch my business as a personal stylist. I didn’t have a burning ‘passion for fashion’ but I’d reached a point where I couldn’t quite shift the feeling that I was meant to do something else with my life. Being a personal stylist made the most sense out of all the options I came up with at the time, as I had trained previously whilst on a short career break. However, I soon felt disillusioned by the fashion industry and all the ways it actually makes women feel like they’re not quite good enough. I decided to tread my own path and I coined the term, ‘Soulful Personal Style’ which is an approach that considers how a woman wants to feel in her clothes first and foremost. It’s about curating a wardrobe that empowers you, regardless of fashion and trends. I have two coaching qualifications yet I didn’t pursue that path initially. My coaching practice is something that’s developed in the last couple of years after talking to so many women who feel the way I once felt, like they have a calling, even if they don’t know what it is. That doesn’t necessarily mean leaving your career and I don’t believe a calling is always just one thing, but it does mean becoming attuned to the things you feel called to do – even if they don’t make sense. Now I help women learn how to listen to their intuition and then be brave enough to follow it in a supported and sustainable way. Personal styling and coaching may not seem like an obvious combination but when you’re committed to changing your life, addressing your wardrobe and how you want to feel in your clothes can be a transformational first step. I do what I do because I love helping women find their way to happier and more fulfilling lives! This in turn inspires other women and creates a ripple effect. This is the work that I was called to do, but you can see from my own experience that I didn’t come to this from a ‘Ah-ha’ moment, but rather it’s been through a series of steps! Each year has come with an unexpected hurdle. In my first year I experienced a bout of depression because whilst I was doing work I love, I was changing as a person. Even though the changes were positive I often felt quite lonely as my friendships also changed as a result. My husband was so supportive and encouraged me to pursue opportunities to meet new, like-minded people, which is vital. In the second year I had a point where I was transitioning into coaching and I had a crisis of confidence because I didn’t want to choose between coaching and my styling work, but I felt I ‘should’. Of course, this is just one example of the kind of limitations we place on ourselves. When I finally gave myself permission to offer both services within my business it was a relief and now I know a lot other people who do the same. It taught me never to try and reduce myself to a label. i know you are a big book lover and so are the followers of loving life after 40. who is your favourite writer? of all the books you've read which one do you think every woman should read and why? Oh dear, only one?! Yes, I love books and quite a few spring to mind, I’m tempted to say that Brené Brown’s books should be on every woman’s night stand but I’m sure your readers already know that, so I’m going to suggest ‘A Million Miles in a Thousand Years’ by Donald Miller. This book made me think very hard about how I want to live and it’s an interesting look at how to apply the principles of storytelling to help you live a better life. For people to believe in the power of love. I know that sounds simplistic, but love encompasses kindness, compassion and forgiveness and we need all of those things more than ever right now. I believe that if we all chose to lead lives led by love then the world really would begin to heal. And choosing love is not a selfless path, it’s a difficult one as it means we need to constantly challenge our own actions, beliefs and thoughts and take responsibility for ‘being the change we want to see’, as Gandhi says. what's the one thing you wish you had really understood when you were younger? That you can have all the talent in the world but what really counts is showing up and consistently doing the work if you want to achieve something. It’s finally being acknowledged that determination and grit are actually far more valuable than raw talent on its own. I still find this very reassuring, even if I wish I’d really understood this when I was younger! We have so much more control and power than we realise. Turning 40 felt a little like coming home! Growing older doesn’t feel like a negative experience to me and to be honest, I feel like I’m more awake to my life and the world around me since turning 40. Maybe that’s because I’ve spent a lot of time letting go of the past so I feel truly free to move forward. I think the best development since turning 40 is an innate belief that I’ve still got a very big life ahead of me – rather than feeling like the best days of my life are over. Friends get into trouble if they talk like about being old or mention that their best days are behind them! No way, I’m just getting started! “Choose experiences, not things”. My mother said this to my siblings and I repeatedly as we were growing up, and it’s always stuck with me. We live in a very material world and yet having less and doing more is the key to being happy. Try writing down a list of 100 things that make you happy, you’ll soon see that very few are actually things at all. This year has been about experimentation and play for me, which means I’ve said yes to lots of things such as speaking and writing opportunities and hosting various workshops – which has been fabulous – but now I’m ready to focus my time on my writing, creating my first e-course and developing a new coaching programme. Personally I’m looking forward to painting more, I’m an abstract artist and I’m also about to undertake a micro adventure swimming every lido in London! (But not all on the same day!). Esther’s next Soulful Style Programme will be open for bookings on Monday 26th September. She will be taking on a maximum of 8 new clients only and is very generously offering Loving Life After 40 readers her ‘family and friend discount’ of 20% off their choice of any of her three Soulful Personal Styling Services. Bookings close on Friday 21st October at noon, or once all 8 spaces are booked. Please use Code F&F40 should you wish to take advantage of this offer. You can find Esther over at her website and on her fabulous Facebook page.